PGP (Pelvic Girdle Pain), SPD (Symphysis Pubis Dysfunction) and general pelvic pain during pregnancy is really common. 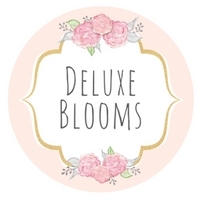 As many as 1 in 5 women can be affected and it is often all thanks to a lovely little hormone called 'relaxin' produced during pregnancy which causes the ligaments in the pelvis to relax. Pelvic Girdle Pain can be incredibly painful and may have a big impact on your every day life during your pregnancy - not just because of the pain, but also the difficulties it can cause in carrying out every day tasks such as walking, lifting, sleeping etc. If like me, you suffered in your first pregnancy, the chances are it will start earlier and probably feel more severe with each subsequent pregnancy - sorry! With Arthur, I really struggled during my third trimester and eventually had to stop driving. 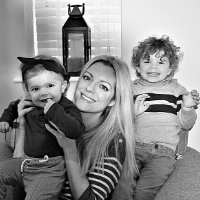 This time around, the symptoms started as early as 9 weeks pregnant - when I fell down the stairs as my legs just gave way from lack of support. Steadily, it has got worse and I now have a set of crutches to help me walk around - which doesn't happen very often because it is just too painful! PGP or SPD is not easy to deal with, but it can feel almost impossible when you also have a very lively 2 year old to care for! I certainly haven't found a cure, but there are a few treatments and products available, many of which I couldn't do without, which do make this condition more manageable and a little easier to cope with...If you are suffering from PGP or SPD I hope you find this list useful, and perhaps get a little relief from your symptoms! The Souls insoles from were designed by experts to support the feet and arches throughout pregnancy. The hormone relaxin, mentioned above, doesn't just loosen the ligaments and tendons in your hips and pelvis where you feel most of the pain with PGP and SPD - it affects your feet too. I have been trying out a pair of these insoles during my pregnancy and they are so comfortable and definitely give the extra support needed. The only thing I have struggled with is that in the recent hot weather I have mainly worn flip flops, and the insoles don't fit in the style of flip flops I like to wear ( unless I snipped a bit of the insole to fit around the part that goes in between your toes!) They work best in shoes, but you do need to find shoes that have a good amount of room towards the end of your pregnancy. The last couple of weeks my feet have become quite swollen, and so I have had to remove the insoles so that I can still wear my shoes. They would have been perfect in my last pregnancy with Arthur ( a winter baby) as I lived in my Ugg boots! I have really noticed a difference in the lack of support since I've taken the insoles out of my shoes - I would certainly recommend investing in these early on in your pregnancy. 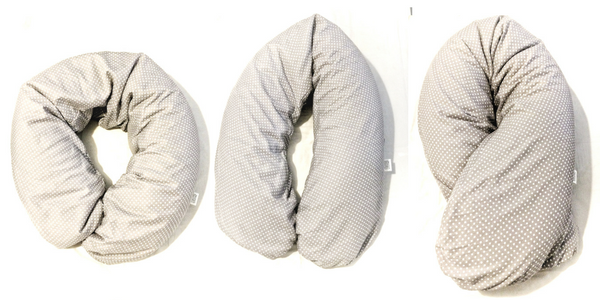 A good support pillow during pregnancy is an absolute must if you suffer from PGP or SPD. I can't sleep without one! 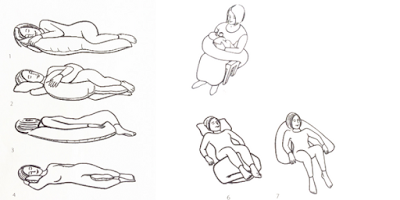 I find that the key areas where support is needed during sleep when you are pregnant is between your knees, under your bump and behind your back...especially if you need a bit of help NOT to roll onto your back whilst you are sleeping! There are lots of different prints and colours, with various material choices such as Twill, Terry cloth, micro plush, jersey and organic cotton. We have the twill cover in 'dots grey' - a perfect choice for us as I am a little bit obsessed with the colour grey...and we don't know whether our next baby is a boy or a girl yet! 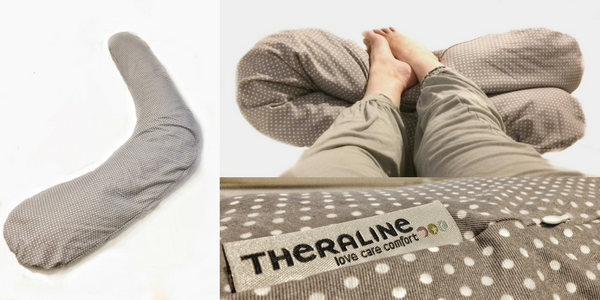 You can buy the Theraline Original Maternity and Nursing Pillow from their online shop on the website (link above) or direct from Amazon. 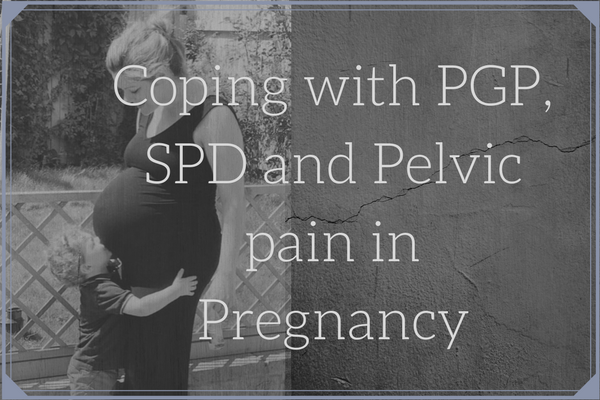 Another 'can't do without' if you suffer from PGP or SPD during your pregnancy. When I was pregnant with Arthur and still Teaching, I took this into school and swapped my 'Teacher Chair' for a birth ball to sit on. Not only does it take the pressure off your hips and pelvis, it also helps to maintain your core strength and stability and allows for good positioning for your baby too! I personally have the 65cm ball and found this adequate for my size. 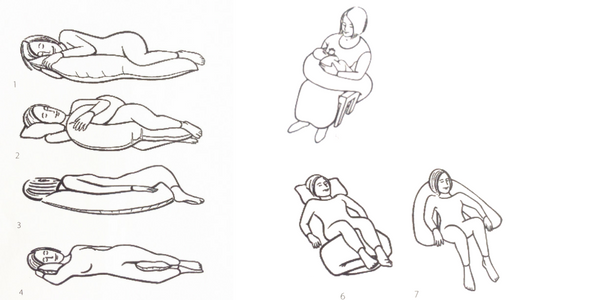 If your baby is 'back to back' you can sit on the ball and lean forward, or lean over the ball to help your baby get into the right position for labour too. This was also much more comfortable to sit on after my labour and was a bit of a godsend whilst trying to 'bounce' a crying baby to sleep. You can buy the birthing ball direct from Amazon here. If I am going to be walking anywhere, or standing for more than 5-10 mins I will always wear a support band. They really do help to take the pressure off a large bump and also add some stability to your hips. I have three different kinds of support bands at the moment, one which helps hold my hips/legs together to stop them 'giving way' and popping out. One which helps hold up and support my bump ( like the picture above) and one which is larger, and kind of does everything! My bump is very low and very heavy this time so I do find that I wear the under-bump support band most of the time, particularly as I now have crutches to help with my legs giving way. It really does help to take the pressure off and you can buy the under-bump support maternity band direct from Amazon here. My NHS Physio also gave me one of these larger support bands to try from Promedics. It has three wide straps - one to go around your hips, one to fit around your pelvis and another to go around and under your bump. It gives an amazing level of support, but it is a little harder to sit down in with is being around the hips/legs too. It is definitely worth investing in a support belt if you haven't been provided with one already - the strain of a heavy baby later on in pregnancy can make moving around very difficult....and the lack of stability in your hips/pelvis can be quite dangerous if like me, they have a tendency to give way at inopportune moments! I cannot stress what a difference this will make - not just during pregnancy, but for anyone! With the amount of hours you spend in your bed it really is worth investing in a good quality mattress, and bed, if you can afford it. Prior to my pregnancies I suffered badly with sciatica and also a period of time where I displaced my sacroiliac joint. My husband has also had back surgery to fix a prolapsed disc. Proper support whilst lying down is vital! It is important to get the level of support right though. Too firm can be just as detrimental as too soft. Whenever we stop elsewhere overnight I usually struggle with back pain the next day because of the difference in support. We are lucky enough to have a great bed in our own room - the divan base has springs and the mattress has lots of pocket springs too - it is a firm mattress but not too hard so it gives a really good level of support. Our spare room isn't so great though, we really need to invest in a decent mattress for the bed in there, as I am sure there may be nights once the new baby arrives that one of us will end up in there!! Disclosure - I was sent the Souls insoles and Theraline maternity pillow in return for an honest review. Some of these links are affiliate links, which wont cost you any more to buy but I may earn a few pennies from the sale. Why not read some of my other posts? Should I give in and try controlled crying? Thanks - yes I totally agree...being comfortable is so important, there are lots f things that try and get in the way of that when you're pregnant aren't there?? I can only imagine how painful this must be for you. I was lucky enough to evade pregnancy with the usual back ache but even at times that felt relentless! I'm glad you've found some remadies to help the pain and I hop these work for other mummies to be who might also be suffering. Thanks so much for linking up at #KCACOLS. Hope you come back again next time.